Janitorial and Maintenance staffs have a wide variety of items that need to be cleaned as part of their daily responsibilities. Everything from Window Blinds, Area Carpets, Tables & Chairs, and Remote Controls to Coffee Pots, Ceiling Fan Blades, Light Fixtures (and much more) needs to be cleaned quickly and efficiently. The task of cleaning is not just for aesthetics. The condition of your client’s facilities not only affects their employee’s productivity, but it can directly influence their clients decision whether or not to do business with them. Additionally, a clean facility helps to prevent the spread of illness and infection, keeping people well for maximum productivity. When cleaning is performed manually, as it is in most facilities, the cleaning is only as effective as the person doing the job. While that person may be a fantastic cleaner, they simply don’t have the time to do highly detailed cleaning. In fact, most of their cleaning is just intended to remove surface dirt. While this type of cleaning is fine for general work, it allows dirt to build up between the gaps, crevices and other hard to reach areas. This is just one of many reasons why various institutions have made the decision to utilize Ultrasonics in addition to traditional methods. Ultrasonics is the fastest, most effective, most efficient and effortless cleaning method available. Ultrasonics allows for items to be “deep cleaned” in a way that manual techniques simply cannot accomplish, and definitely not as quickly. In fact, it may take a person 45 minutes to thoroughly clean a light diffuser (especially if it hasn’t been cleaned in a long time), and they still won’t achieve the desired results. With Ultrasonics, this task is typically done in 1 minute, and the results are phenomenal (see picture above). If you are responsibility for facility maintenance, building service maintenance and other related tasks, take some time to learn about how Ultrasonic Cleaning works and what it can do for you. 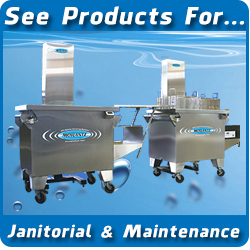 Click here to learn about How Ultrasonic Cleaning Works. If you have any questions, use the form on the right or call 215.969.0266 for more information.